I've heard this being discussed before, and has been in previous city budgets, but the city has been studying this in more detail lately. It would be a completely new structure on the current city hall block. Jay Smith, O'Brien Atkins, pointed out his firm asked to review two sites on the City Hall block. Option A is the existing municipal building at the corner of Hargett and McDowell. It could include a 14-story building, 200,000 total net square feet, 4 floor base including 19,250 net square feet per floor with a 10 story tower of 12,300 net square feet per floor. This would be a 30 percent grossing factor with a total of 260,000 gross square feet. Option B is the corner of Dawson and Morgan Street adjacent to the existing parking deck. This site could accommodate a 10 story building with 200,000 total net square feet that is 20,000 net square feet per floor, 30 percent grossing factor with a total of 260,000 gross square feet with 77 percent efficiency. Mr. Smith gave the results of a solar shading study for the winter solstice and summer solstice for each option. He also presented a floor plate study for each option. He presented the following pros and cons for each option. He [City Manager Russell Allen] talked about the timing and renaissance of the downtown area pointing out maybe it is time to build a signature building for City services. City Manager Allen pointed out staff and the consultants continue to believe that Option A is the best site. It gives more flexibility, an entrance to the north, secure access, public entrance on the east, more engaging pedestrian activity and entrance on Hargett Street for the public and an opportunity to provide a signature building across the street from one of the public squares. There is a bunch of discussion on this item, but I thought the above quote was interesting considering the comments we've seen on this board about Allen. I think he's been given a bad rap for the Plensa fiasco. On the May 8th meeting, the city endorsed the future location of the bldg using Option A, which would replace the old police station at Hargett & McDowell. The mayor stated he feels this is a good opportunity to have a major public, signature type building fronting on Nash Square. BTW, this project *HAS NOT BEEN FUNDED*, but it is in the pipeline, and will be needed in the next few years. It's likely that it would go in a future bond issue. I just thought folks would want to know about future plans in this area. Nice, I've been thinking that its about time for the city to revisit that site. I know they've got lots of offices spread out everywhere, this would be a good chance to bring them back together. I'm glad that they're thinking "signature structure" instead of "government bland." I wonder what kind of design elements they might consider.. (i.e. glass tower, non-boxy structure, LEED elements, etc.). This is going to be an itneresting project to watch in the future. If they were to build a new building on option "A", could they not just include a new police station in this proposed "signature" building? Make it tall and unique? Kind of like what Westin is planning for there two hotels in one building on Hillsbourgh st. Also, doesn't the city own the old Raleigh Federal Saving's building on Fay. st.? And the 4/5 story building located at 301 Hillsbourgh st.? It sounds as if they have a need for 200,000 sq ft +++++++++++++++and lets not forget future needs? DwnTwnRaleighGuy, what is this Westin project you are talking about? Personally I like option A, and I agree that the Police Station should be included. Sorry, I meant "Winston" NOT "Westin"! Wishful thinking I guess! If they choose option A will they: 1) also remain in the existing city hall building next door, 2) move the police dept into the existing city hall. If they do build a "signature structure" hopefully they will construct it large enough to handle the rapid growth that is sure to continue. 200,000 sqft sure seems a bit conservative. DwntwnRaleighguy: yes the city does own the Raleigh Federal bldg on Fayetteville St. as well as 301 Hillsborough St., but isn't that the building and lot the city is selling Reynolds for their tower? If I remember correctly, the people who are working in the building at 301 Hills. will be moved to the Bank of America or BB&T building on F. st. So I definetly agree with you that 200,000sq is on the lower side of what I think they should build. I don't know if I can reprint this? design services for the center. Council will consider funding options during next year's budget process. This will inch the skyline a tad more towards the Clarion/Reynolds/Quorum/West side of town I think. Maybe this will look like a real city hall that other cities have...not necessarily classical in design but something that grabs your attention a little. Here's the N&O article on the RFQ release. Interesting that they explored partnering with the state--for the block south of the Gov's mansion, but to no avail. Another article on the new city tower. The city will be exploring reallocating employees from One Exchange Plaza (and perhaps the firse station block west of Nash square) to the new building, and selling the others at a nice profit. Allen says once they get designs worked up, estimates and funding allocated, the building could be complete by 2010. That would be nice if they can get everyone into one building and sell off some of their others. With the potential profits that can be make from the sale of the other buildings, they could probably pay for the new building mostly with the profits. If that is the case, why not add a few more floors to it to ensure there is plenty of room for expanding the departments....some of the land the city owns downtown is quite attractive to developers and a sale of that land could open up the possibility for even more high rises . In keeping with the frackus with the State, the City should incorporate parking into this building ala RBC, Edison, PE II, etc, so that they have the flexibility to remove the deck that faces Morgan and McDowell....it is quite appotomy (sp) of ugly...even the County made plans to take down their ugly deck and replace it with an office wrapped structure....surely the City doesn't want to be a hypocrate in light of recent publicity in their favor do they? Twin towers...or even three one day would be nice and of course efficient. The Raleigh City Council voted unanimously today to award a $954,300 contract to Kling Stubbins/Cherry Huffman to provide design work and other professional services for construction of the Clarence E. Lightner Public Safety Center. The public safety center will be located on the corner of Hargett and McDowell streets, currently the site of the City of Raleigh Police Department headquarters. The 15-story, 260,000-square-foot facility will enhance the City’s ability to consolidate public safety operations and other local government offices and functions at one location, including the City’s police and fire departments and the Raleigh/Wake Emergency Communications Center. The public safety center is named in honor of the late Clarence E. Lightner, who served as mayor of Raleigh from 1973-75. I would hope they will be building for the future and not necessarily what is needed right now. As fast as Raleigh is growing, it would be much less expensive to add a couple of extra floors now than hunting for extra space in 5-10 years. I spoke to someone with one of the design firms last night, and he said the building program (layout) is still being determined--no designs or even engineering drawings yet--but that he said it could be 18 stories. I'm sure it's too early to say what the completion date might be. I would guess it could take at least a year for final construction drawings, and then the fun begins... finding funding for a potentially $100M building. There has been talk of going with LEED certification, which would be in keeping with the current council's priorities. Wow. 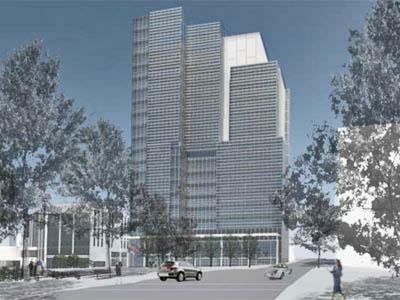 An attractive 18-story office tower at that location will look fantastic. It will probably look much taller being there by itself. I know this reply may be better suited for the skyline topic, but this could really fill in gaps looking east between Wachovia and RBC, and between Wachovia and Reynolds looking north. they are already planning the moving involved for existing departments in the old building. raleigh traffic operations is based out of the that building and are in the process of finding a suitable location to move. ...raleigh traffic operations is based out of the that building and are in the process of finding a suitable location to move. I doubt the move will wake them. Tip your bartenders. Good night. Hard to judge by this rendering, but I think I like it. However, it does look odd sitting adjacent to the much smaller City of Raleigh building. It also looks like it will complement the new Reynolds building. I was going to post that I saw the new building program raised the total sf to 304k (council agenda), but now we get a rendering... I can't really tell much from that small rendering other than basic scale (much bigger than adjoining Upchurch complex!) and that it looks glassy and modern... probably lots of natural light. It also looks like it will complement the new Reynolds building. Probably because it was designed by the same firm, Kling Stubbins. The story says 17 floors but the picture/rendering shows 19?